Earlier this week, I read this article in the Washington Post about Josh Duggar’s inappropriate (and quite frankly, gross) actions against several of his sisters and another family friend. That alone isn’t worth blogging about, though. What is worth writing about are are similarities and difference between sin and crime–something that the author of this piece doesn’t seem to understand. The author seems to think that “repentance” is equal to getting off scot-free, and that there isn’t any sort of price to be paid for committing sin, whereas with a crime, there is a cost–jail, usually, or a fine of some sort. When you treat this as a sin instead of a crime, you let everyone down…The behavior alleged was a crime, not a sin. Actually, it’s both. If I commit murder, I have sinned and committed a crime. Same with theft, abuse, using illegal drugs, etc. There are some things that are sins but aren’t crimes, like adultery. You can’t go to jail for sleeping with your co-worker’s wife. No one’s going to lock me up for not observing the sabbath or for taking God’s name in vain (at least in the United States). Let’s look at a few terms, here, because the author didn’t, and that’s a big problem. There are also different types of sin. We see, in this definition of sin, that no sin only hurts one person. Sin is an offense against God. It is opposed to grace. Sin removes grace from your soul, and places you farther from God. What Josh Duggar did (and he confessed to doing it, so this isn’t alleged behavior) is both a sin and a crime. He committed a sin by violating one of God’s commandments–sexual acts outside of marriage are wrong. (While the Duggars have some pretty extreme courtship measures, the general message of “no sexual activity until you’re married” is a tenant of Catholicism, as well. But full-frontal hugs are allowed, and I never dated with my siblings as a chaperone, etc. The Duggars embrace a pretty hard-core version of purity, which the article discusses.) So that’s sin. However, it’s also illegal to perform sexual activities on others without their consent, so that’s the crime portion of the situation. Both require confession and punishment/penance, but they go about it differently. 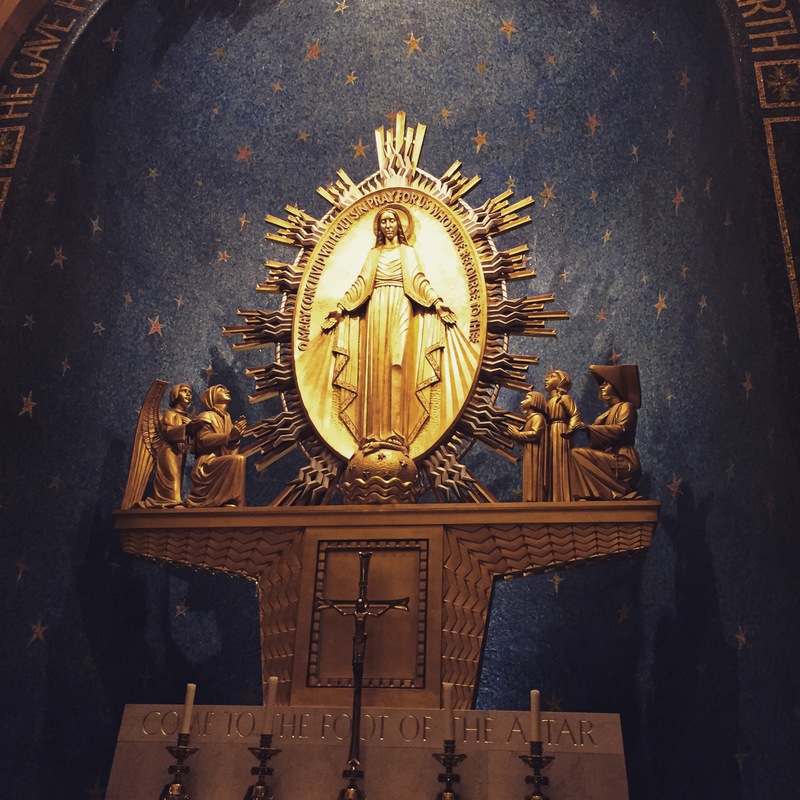 Now, that being said–confession heals the person’s relationship with God. When criminal activity occurs, the Church believes that the process of law and due process has to happen for the common good of society. For example, if a murderer comes and confesses his sin, the priest will strongly urge that person to confess to the authorities, as well. It’s part and parcel of justice, which is a virtue. If you steal, you not only confess it–you have to pay back what you stole. So, yes, Josh’s parents would’ve had to turn him in to the authorities. What happens after the crime has been admitted is a different thing in different localities, and thus outside the realm of this discussion. However, the thing to remember is that sin hurts everyone. When you sin, you don’t just confess and get off scot free. There has to be penance, there has to be contrition and yes, you have to do your penance. The author of this piece is wrong when she suggests that sin and crime are different things, and that one is more or less serious than the other. Sin and crime are both offenses against other people, and both must be dealt with accordingly, whether sacramentally or judicially. First off, we had amazing weather. It was in the 70s and just perfect. No rain, no clouds–perfect. Which was good, because we did a lot of walking and being outside! 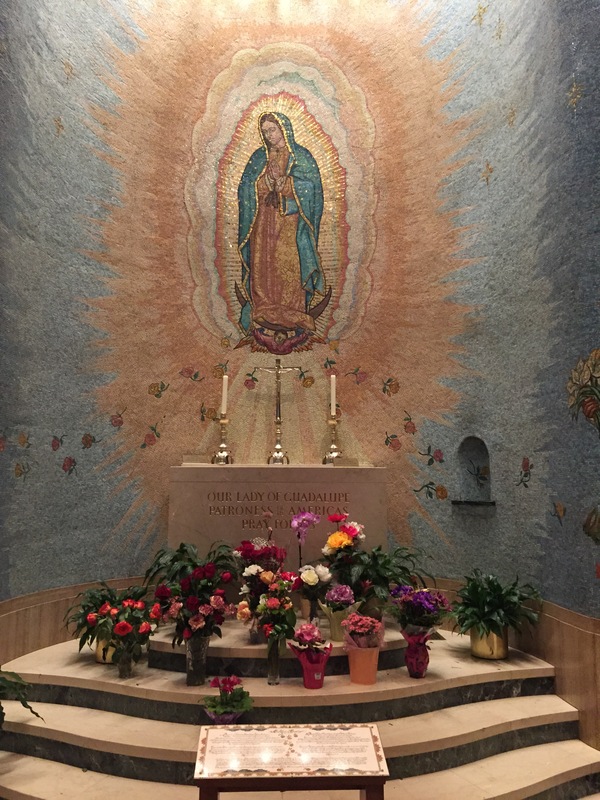 On Thursday afternoon after checking in, we went to the DHS for the Office of Readings and Vespers, and then went to dinner at the Potbelly Sandwich Works on Monroe Avenue, down the street from the DHS. 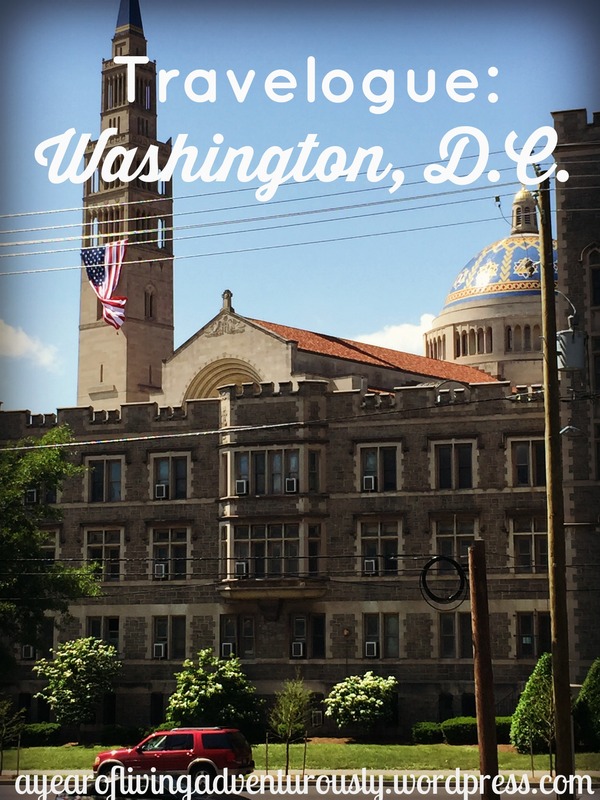 The DHS is across the street from the Catholic University of America and the Basilica of the Shrine of the Immaculate Conception. The last time I was in their neighborhood (11 years ago), it was sort of scary after dark, but now it’s become really beautiful and here and there are all sorts of little shops and restaurants that have sprung up. Potbelly is one of them. Dinner was quick because we had to get the friars back for holy hour, which was at 7:00, and then compline right after. So most of the first day was spent entirely at the DHS. We got back to the hotel around nine. The next morning was actual ordination day. The ordinations were held at St. Dominic’s Church in D.C. which is (duh) run by Dominicans. The institution of the second and third orders (Love this!) at St. Dominic’s. The church was packed. I counted several religious orders in attendance: the Missionaries of Charity (yeah, that got me excited. Mother Teresa’s nuns! In person! 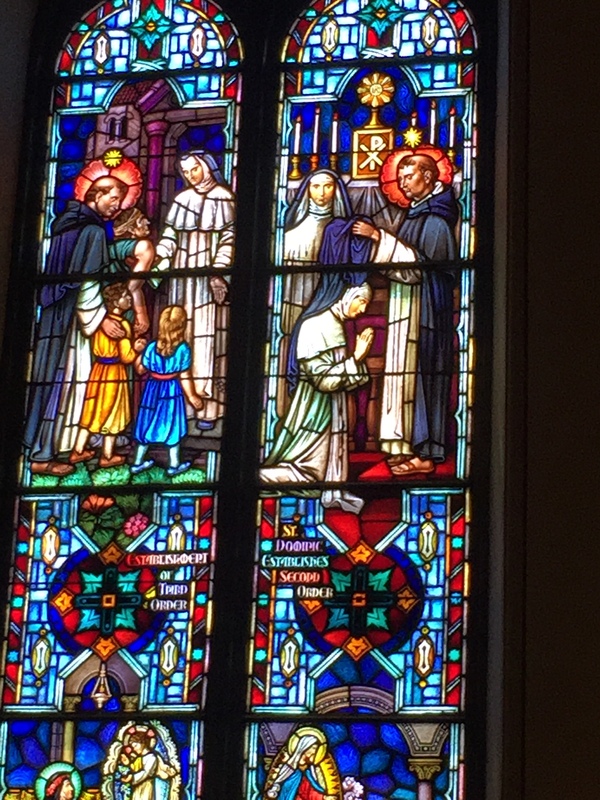 ), a Benedictine monk and nun, a Norbertine, a Sister of Life, and of course Dominicans, including the extern sister from the Summit Dominicans, Sr. Mary Magdalene, and Dominican Sisters of Mary, Mother of the Eucharist (Ann Arbor). The Mass was beautiful and was presided over by the Apostolic Nuncio (ambassador) to Ireland. After Mass, we headed back to the DHS for the first party of the day. Their cloister garden was beautiful and the perfect setting for this. 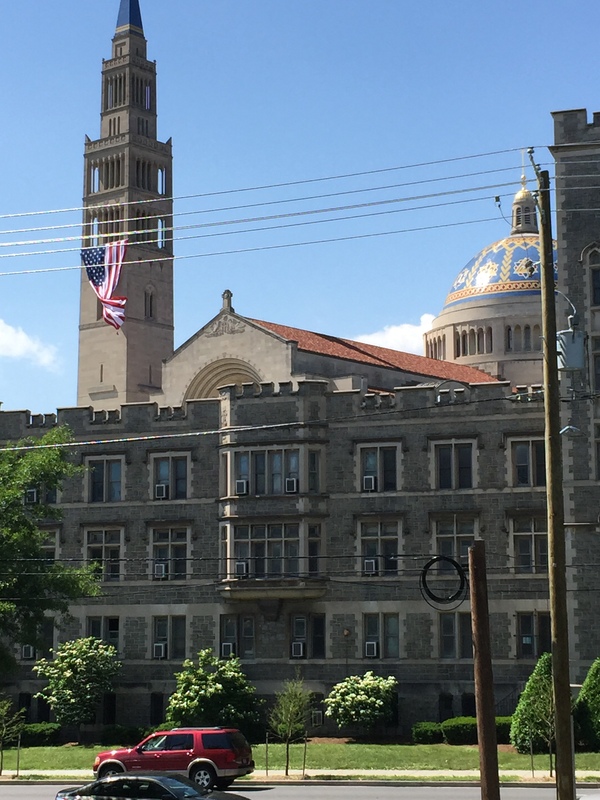 View from the House of Studies’ front door–that’s CUA in the foreground and the basilica behind. 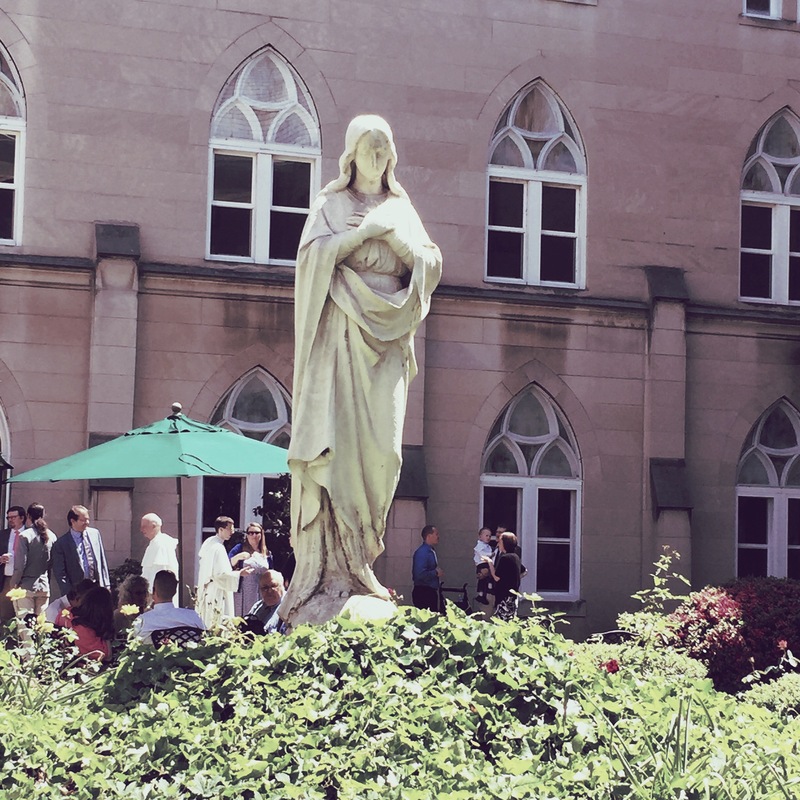 Mary in the cloister garden. 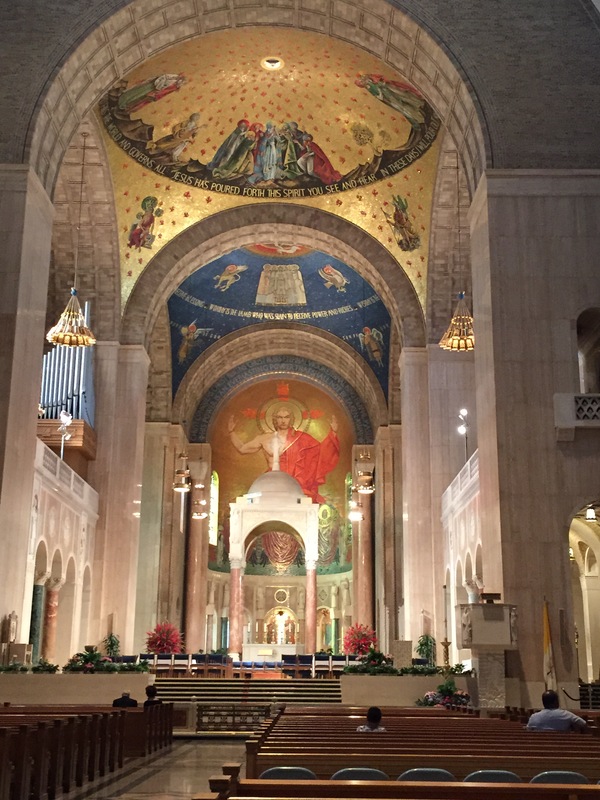 After the lunch party, we headed to the Basilica of the National Shrine of the Immaculate Conception, which is the national church for the United States, and is just amazing. Here I visited the shops and got some gifts, as well as books for me. Because, yes, a good Dominican loves bookstores, especially religious ones! 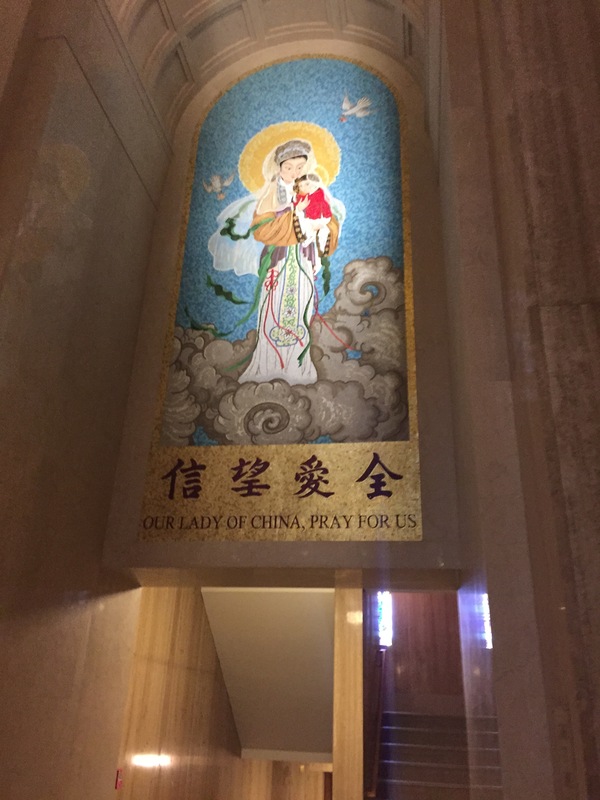 I also visited the sanctuary to pray and light candles for people. 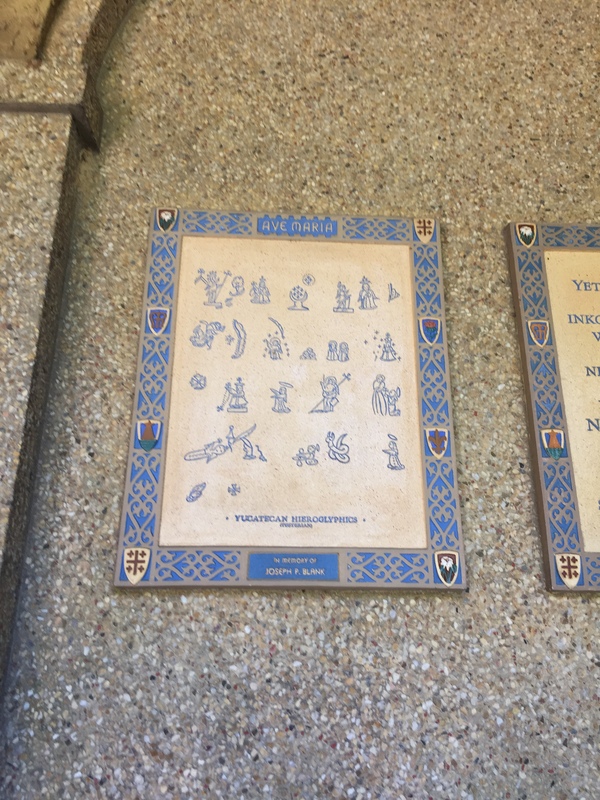 It was also really cool to see the Jubilee Year doors (see below)–I’d never seen them in person before. 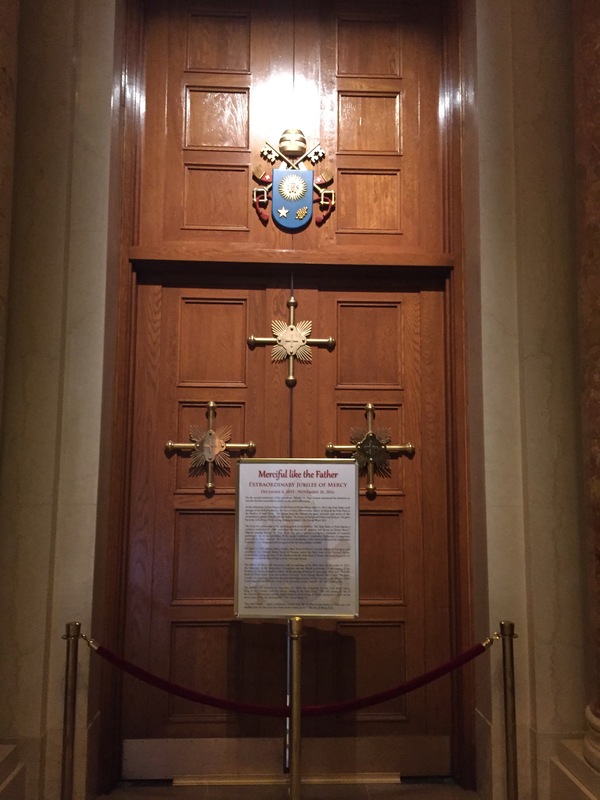 The Jubilee Year doors for the Year of Mercy with the papal coat of arms above. Outside the basilica, enjoying the gorgeous weather! After the basilica, we had dinner at Busboys and Poets,which is basically my Dream Business. It’s a cafe and bookstore (the bookstore is stocked by Politics and Prose, which we visited the next day). The staff was super-friendly and the seating was eclectic (there were velvet chairs!) and comfortable. The food, by the way, was great. My burger was the Ideal Burger. Dinner was followed by party two, which was less formal than the lunch party, at the DHS. The entertainment was provided by the student brothers’ jazz band, and drinks and h’ors d’oeuvres were served. The party went until 9:30, when Compline was said in the chapel, and I had a great time talking to one of the brothers about Jane and literature. Because that’s how I party, guys. 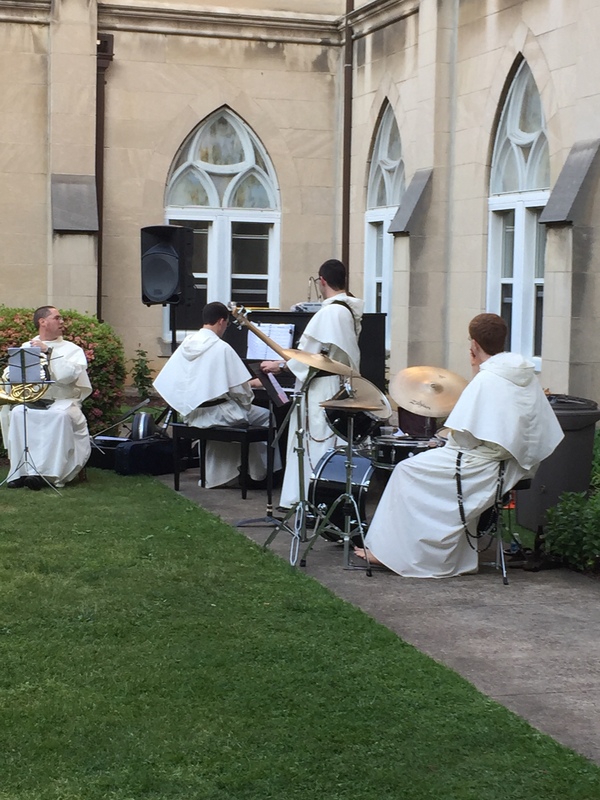 The student brothers’ band playing in the cloister garden. Saturday started with lauds and Mass at the DHS, followed by breakfast at Busboys and Poets again. I’m glad to report that breakfast was just as good as dinner had been. If I lived in this neighborhood, I’d be here all the time. It was so fun. There were a bunch of fathers having breakfast with their daughters, which was also adorable. 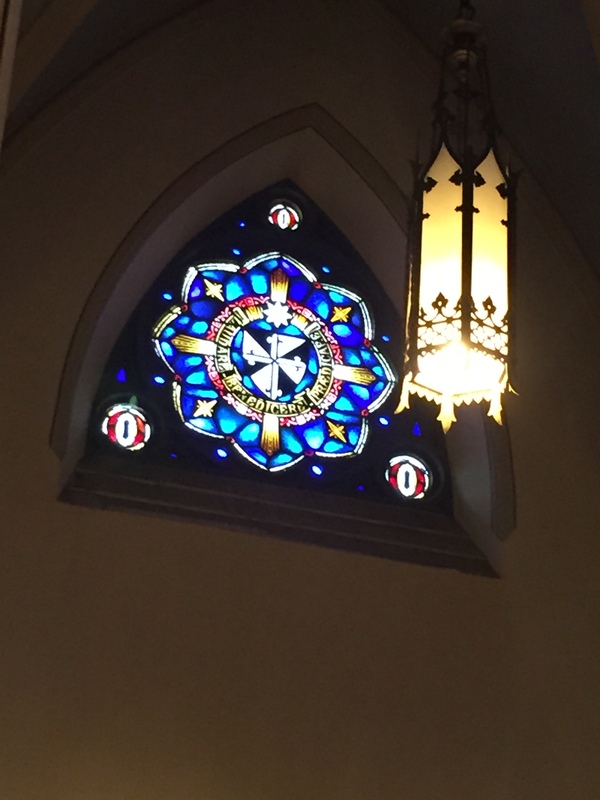 We stopped back up at the DHS to say good-bye to the brothers, then headed the Franciscan Monastery on Quincy Street. 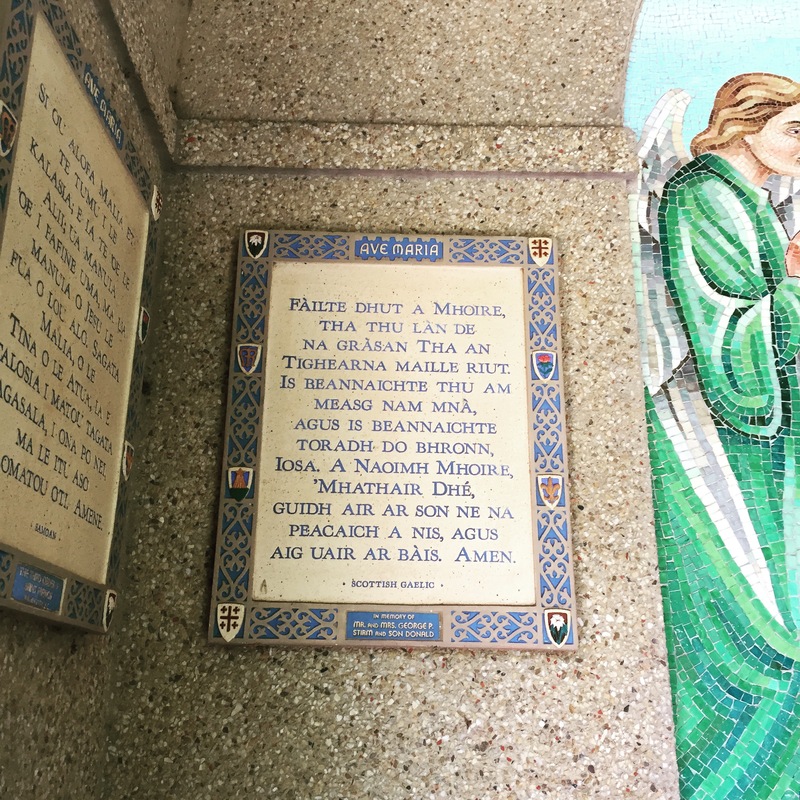 The Hail Mary in Scottish Gaelic. The Hail Mary in Yucatan hieroglypics. Really. So–more on the Monastery later, I promise, because it was amazing. 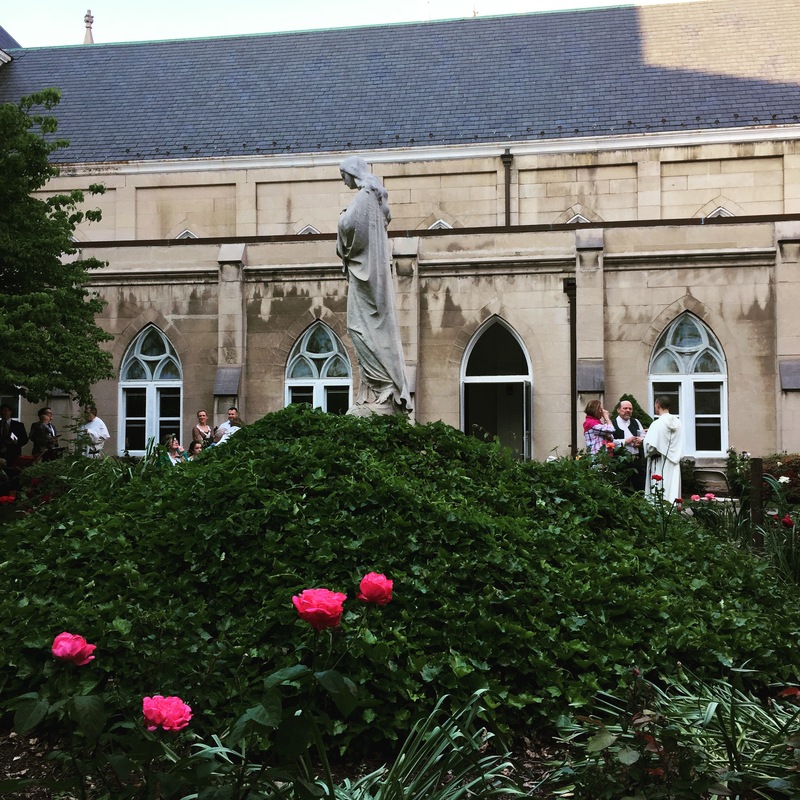 The garden alone made me want to be a Franciscan! The monastery was followed by our final D.C. stop, Politics and Prose on Connecticut Ave., so I could sate my Independent Bookstore thirst. P&P is pretty famous in the D.C. area, and for good reason–it’s crazily well-stocked and has tons of author events (there was actually one going on when we were there), and has a book printing press, if you want to get your Great American Novel published. It’s two floors (with an elevator)–cafe, sale books, and kids’ books are on the lower level, and everything else is on the first floor. You will have to climb on the shelves to get certain books. It’s not a great place for short people, but the staff is very helpful! But I found two books about Jane, which made me very happy. P&P was our last stop in D.C., and then we headed home. I told you–whirlwind trip. Not the typical travelogue for me. What a weekend! 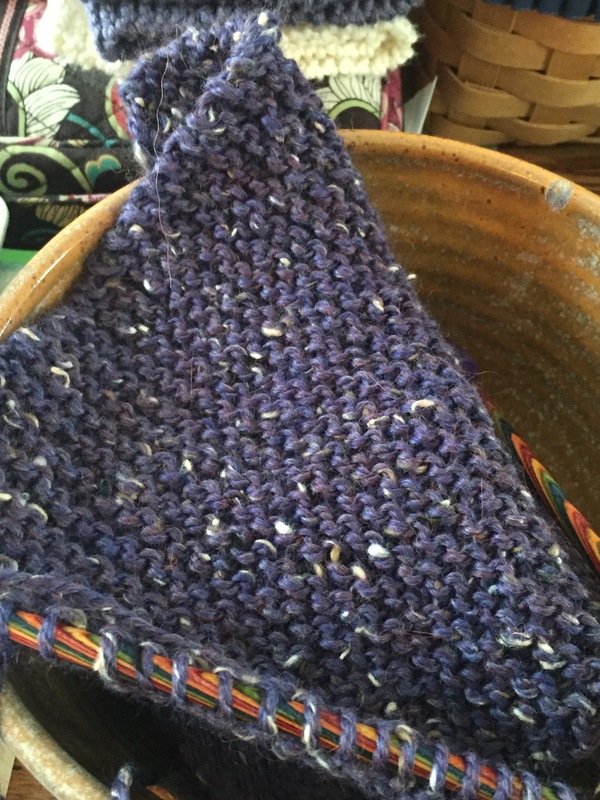 I spent a lot of time with my needles and yarn! Let me take you through it! First, remember this guy? Yes. 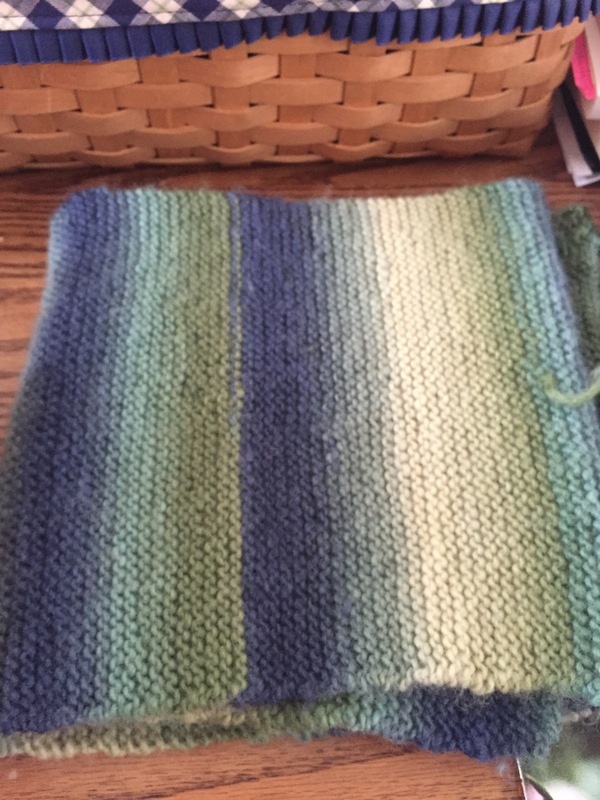 I have finished the long scarf/cowl thing, and as I was knitting it, I thought it would make a great birthday present for one of my always-cold friends. Her birthday is in September, and these are her favorite colors, so big win there! I love how it turned out. 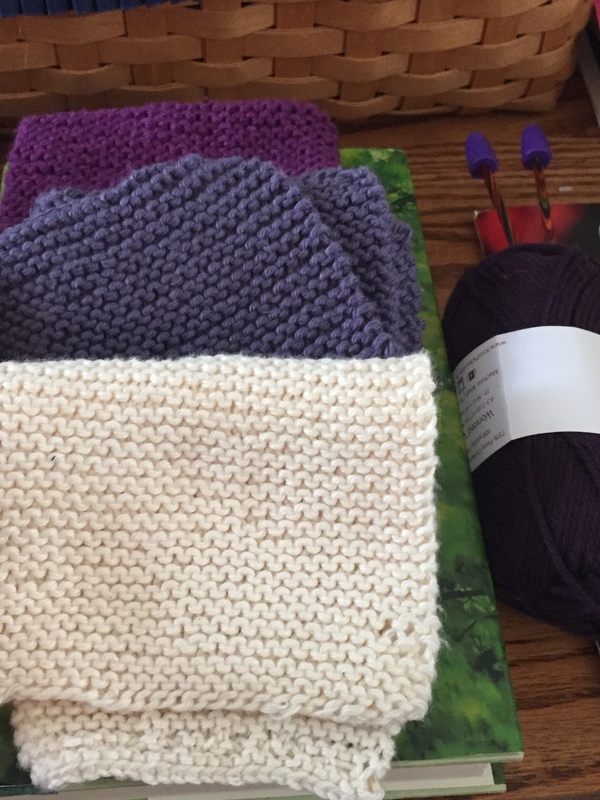 Second–at the top you can see the finished “lilac” washcloth. On the right is the last skein of yarn for the Washcloth Housewarming Gift Project. This one is called blackberry. 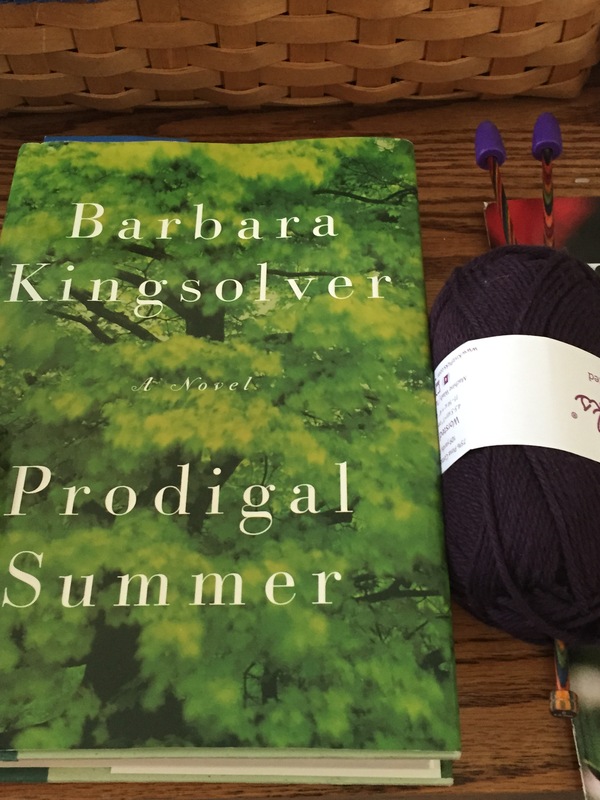 The book part: I’m reading Barbara Kingsolver’s Prodigal Summer, which I’ve been wanting to read for awhile, but once Modern Mrs. Darcy suggested it, I was glad to find it for $4 at Half Price Books. 🙂 So that’s what I’m currently reading. People, this yarn. It’s called morning glory, and it has the slightest red tint to it. I love it. This is a scarf for a charity project. My Lay Dominican chapter collects hats and scarves to give to the patients at the local VA hospital, and this is my contribution. I’m knitting this up on 10 gauge Harmony Rainbow needles and it’s fantastic. It’s almost Memorial Day weekend here in the States, which is the unofficial summer kick-off. Barbecues will fire up, pools will open, and school kids enter the homestretch of the school year, if they’re not already out. In my house, Memorial Day means it’s time for the Great Jane Re-Read. Yes. 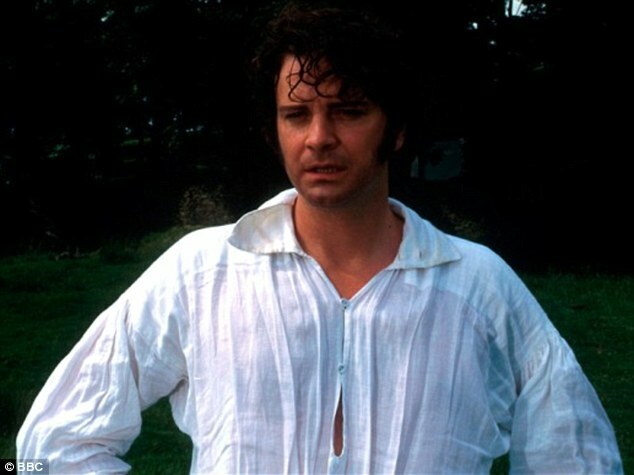 I wasn’t drawn to Jane because I was naturally precocious–I was drawn to Jane because of Colin Firth. During summer vacations, my best friends and I would spend a lot of time on hot summer days watching movies in one another’s houses. One day, Tiff whipped out her parents’ 6 volume VHS set of Pride and Prejudice. I’d been wanting to read the book, but I hadn’t–yet. Why do I re-read her every summer? For a lot of reasons. I get more familiar with the books; they seep more deeply into me. And there’s things I notice every time that hit me differently. I’m not the same person I was the last time I read these books. I find myself liking or disliking certain characters more. For example, I really disliked Emma the first few times I read her book. Now, she’s getting better (but is she “handsome enough to tempt me?”). I intend, as I re-read these over the summer, to write about each book after I finish it–a bit of Jane notes, if you will. And of course I’ll direct you to my Jane series that I did last year. Will you join me in the re-read? Which Jane protagonist is your favorite? Which is your least favorite? Next week there won’t be a 7QT, since I’ll be in D.C. and attending ordinations that day, so I won’t have time to write! I’ll be churching. 🙂 But I am so excited to be heading to D.C. since I haven’t been in so long, and I’ll be with some great friends. Plus, our hotel offers free homemade cookies–hot–for all visitors. Really? Can I just live there forever? Let’s talk about some season finales of TV, shall we? I love The Middle. Sue Heck is an awful lot like me, from her love of Disney World Planning to her academic endeavors. Last night’s season finale really struck a chord with me. Sue has been trying, all year, to have the Best Year Ever. It’s her Senior year of high school (AKA, The Year of Sue), and she tries to win one of the class superlatives (best smile, etc. ), get accepted to a great college, have the most school spirit, and generally be all around awesome. But leading up to graduation, everything goes wrong. She loses her yearbook–and her name is misspelled under her photo She’s not eligible for any honor cords because her activities “don’t count”. She misses getting the perfect attendance award because she snuck of campus to eat lunch. Her graduation motorboard is way too big. She doesn’t even want to go to graduation now, because she feels like nothing she did mattered. She has left no legacy. She feels like a loser. But her mom convinces her to go to the ceremony. 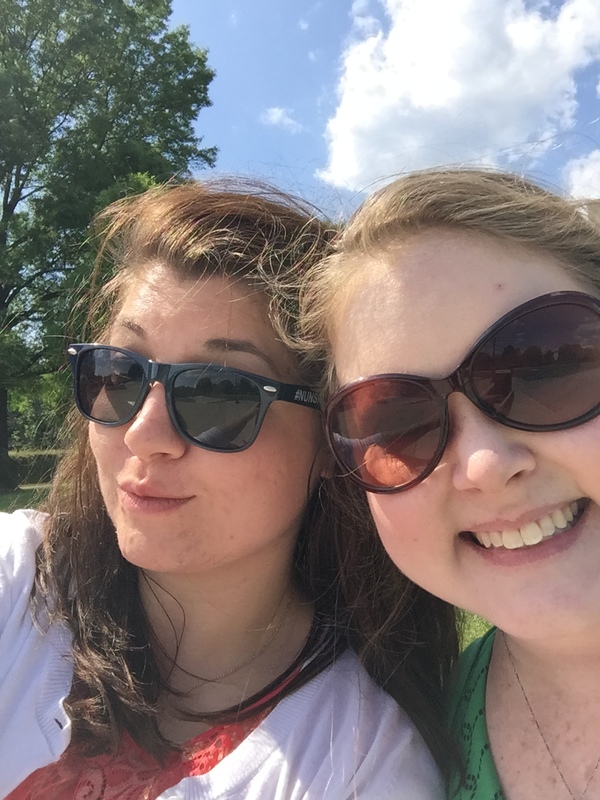 At the ceremony, her yearbook is returned–full of notes from people who did notice her, and appreciated her, even if she didn’t get any honor cords or win any Senior Superlatives. She sees the impact she had on the members of her class, and she had no idea they even felt that way. I feel like Sue sometimes, like everything I do is just passing and I won’t have any lasting legacy anywhere. But The Middle reminds us that people do notice those little things, even if they don’t write about it in our yearbooks. Another TV finale wasn’t quite so satisfying, and that’s Bates Motel. Now, I love Bates Motel on a lot of levels, as I’ve previously discussed. But this year it started going off the rails, relative to actual CF/transplant things, and this makes me Displeased. Emma’s been on the lung transplant list the entire time the show has been on the air, so three years. She hasn’t moved up the list in all that time–her condition has been pretty stable. But this season she started to deteriorate a bit. Now, the way lungs are allocated is something called an LAS score. Basically, it takes into account how sick you are. The sicker you are, the higher up you are on the list. Emma, actually, probably isn’t sick enough to be first in line on the list. Yes, she’s on oxygen, but her condition is pretty stable. However, on the show, her dad tells Dylan (Norman’s brother) that the reason Emma hasn’t gotten her transplant is because they don’t have $20,000, which they apparently need to bribe someone to move her up the list. Um, no. No no no no five thousand nos. The only way you move up the list is by getting sicker. When I was called for my transplant, I was the top person on the AB+ blood type list, because I was the sickest person that was also the best match for the lungs I received. It’s sort of a complicated process. Organs have to match blood type, tissue type, body size, etc. Emma could only move up by getting sicker, or by people passing on the chance to have the operation, or being removed from the list. So anyway, in the season finale, Emma gets her call (this is after Dylan has come up with the money and given it to Emma’s Dad). Emma then proceeds to have a crying jag/meltdown in front of Dylan. Now, I know this makes good TV because it’s cathartic and all that, but you have to talk to social workers and therapists about this stuff before you can get listed. You have to be totally on board. You can’t be sort of wishy-washy. Now, yes, I understand that Emma’s a little freaked, but by the time you get the call, you are about to die, normally. Dying on the operating table doesn’t really phase you, because you are going to die without the surgery very soon. So anyway, this is all so wrong, people. So, so, wrong. However, she is right about lungs being tricky, in the transplant world. They are. Lucky us. The Royal We: Totally based on Prince William and Kate Middleton (right down to Kate’s fashion choices and wedding dress), only the girl is an American, this story of the future King of England meeting his fiance at a British University is well-told and charmingly written. Nicholas and Rebecca meet cute, break up, and finally get engaged–but will they make it to the altar? Nicholas’s brother, Freddie, is hysterical, but Rebecca’s twin is sort of annoying. But this would definitely make a great beach read. If you’re a fan of the British Royal Family, then give this one a whirl. Made In the U.S.A.: I found this on the remained table at B&N, read the first chapter, and was drawn in to the story of Lutie and her brother, Fate, who are left alone after their stepmother dies of a heart attack in the local North Dakota Wal-Mart. Intent on escaping Child Protective Services, Lutie and Fate drive to Las Vegas, the last known address of their ne’er-do-well alcoholic father, sure that if they find him, he will take them in. 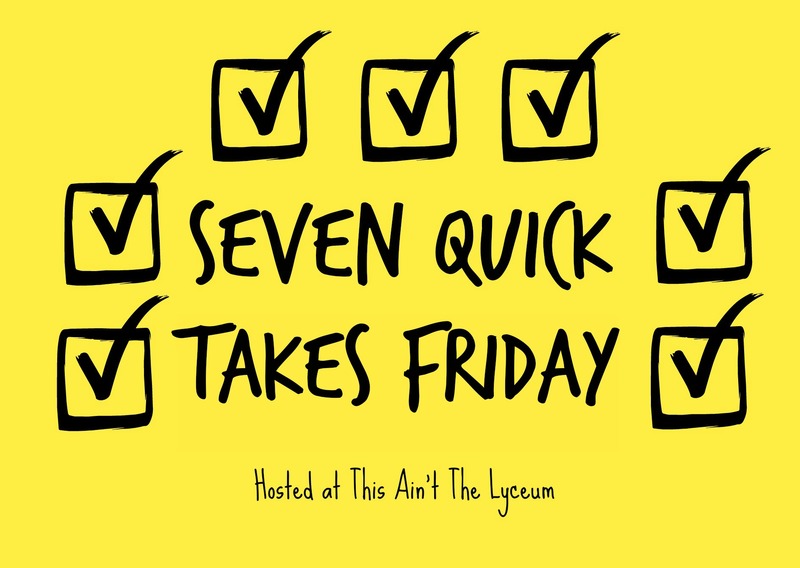 But things definitely do not work out like the pair plans, and they’re finally rescued by Juan, a Mexican immigrant who takes the children to his family in Oklahoma. 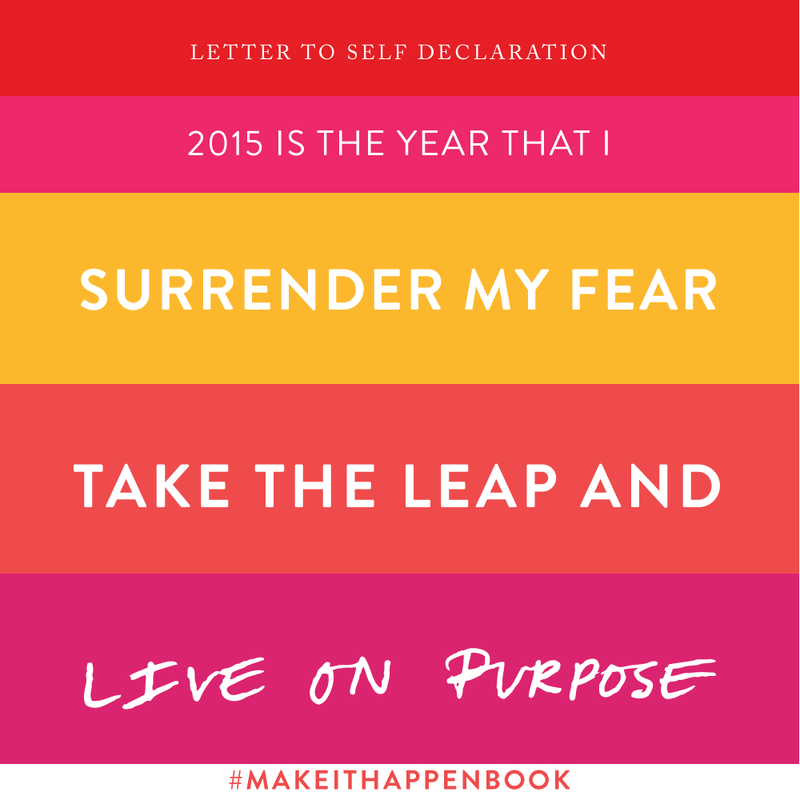 The Happiness Project: This is one of my must-reads, and I’m reading it again. It’s a great kick in the pants for self-motivation to Do Better and Achieve Goals. Still Alice: The movie that won Julianne Moore her elusive Oscar is much better than I thought it would be. The book is good, but the movie is better–this falls into a small category of books and movies where this is true, for me (some of the others are The Wizard of Oz, Gone With The Wind, and Harry Potter and the Order of the Phoenix). Moore plays Alice, a linguistic professor at Columbia who is diagnosed with early-onset Alzheimer’s. Moore’s performance is realistic and sympathetic, but the other best part of the movie is Kristin Stewart’s role as Lydia, Moore’s “black sheep” daughter, who comes home to take care of her mother while her father (Alec Baldwin) moves to Minnesota to run a study at the Mayo Clinic. Stewart and Moore could be mother and daughter in real life, and they play beautifully off one another here. I loved how their relationship evolved throughout the movie. Panic Room: Yes, another Kristin Stewart movie! This time she plays Jodi Foster’s daughter in a thriller that places both of them at the mercy of three robbers. This is one of Stewart’s earliest film roles, and she and Foster are a believable mother daughter pair, complete with the sass and eye rolls. It’s a tidy thriller that ends somewhat predictably, but it’s a good movie to watch if you’re not up to following a complicated plot. CCD winds up this weekend. I’ll miss this class, which was much smaller than my previous class of 35 kids. But each year’s class has its own plusses and minuses, and this has been a pretty good group. I’m curious to see how many we have next year, since that affects the “arts and crafts” aspect of the curriculum. With a group of 35, you really can’t do too many art projects, but with 20, you can. Can you believe we’re halfway through May already? I can’t. I swear things move faster as we get older. I’ve always been jealous of great gardens. My grandma always had perfect flowers and a tomato plant in her backyard; one of my favorite things to do with my grandpa was pick tomatoes from the vines and bring them to my grandma for use in summer dinners. 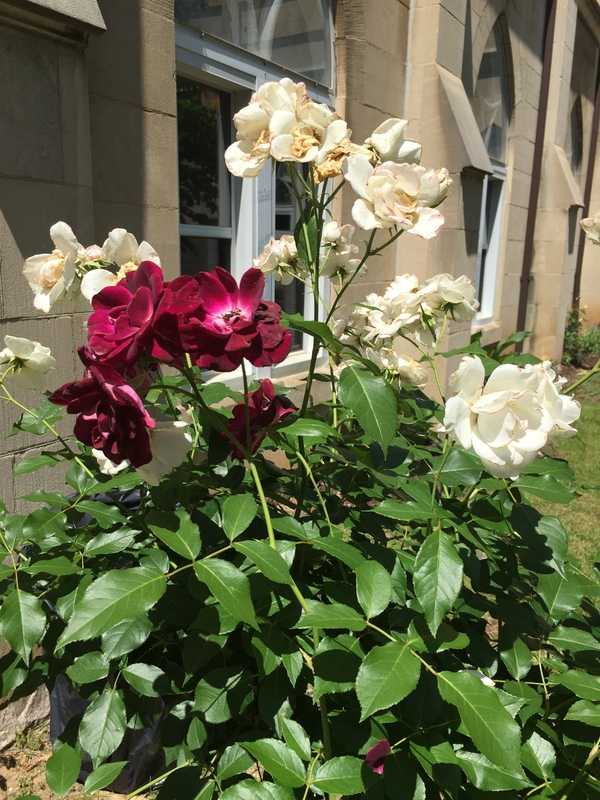 There were always a few tomatoes on her kitchen windowsill, and her flowers were perfectly planted in the brick planters that bordered their front porch. My grandpa, a fierce gardener, also planted snapdragons around the lamppost in the front yard. Two packs of seeds–basil and cilantro, both of which I use a lot in recipes. Fortunately it’s not time to plant here in Ohio yet. That’s not until nearer the end of the month. So I need to figure out what type of potting soil to get, and how much of it, and then I can plant my seeds around memorial day…and hope for the best! 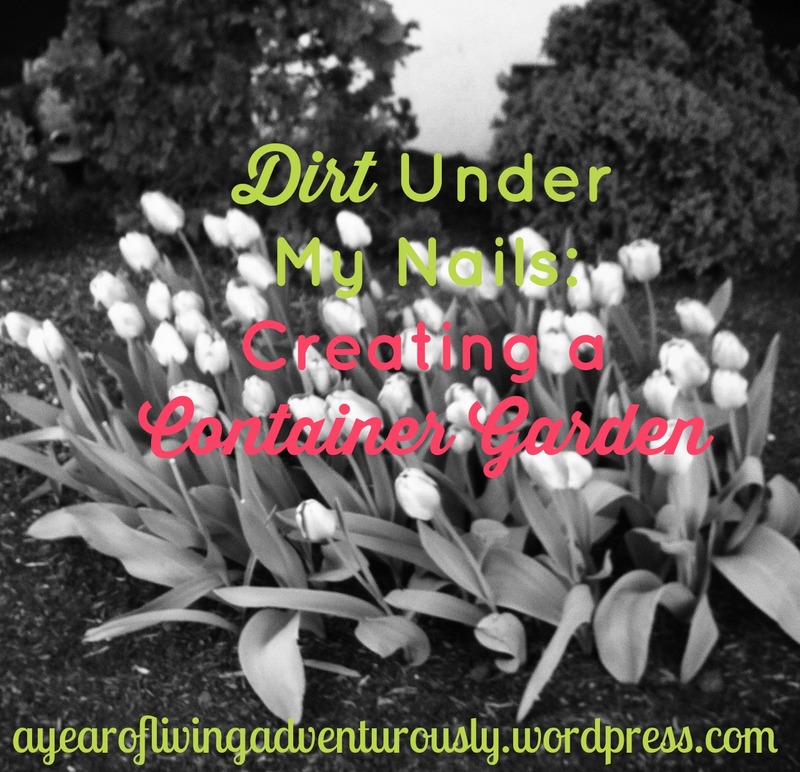 Do you keep a garden? 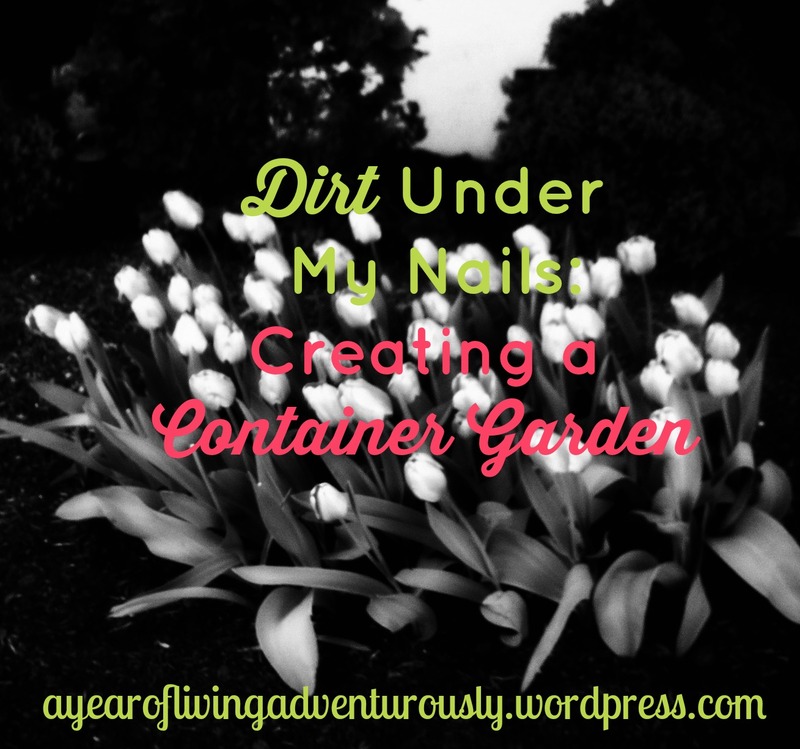 What are your best gardening tips? Leave them in the comments! BONJOUR, FRIDAY!!!!!! I’m so happy to see you! I’m going to D.C.! I haven’t been to the capital in ages and I’m so excited to be going with my friends Mary and Katie for Dominican ordinations. The last road trip the three of us took, it was to Nashville to visit some Dominican sisters. We had a blast. I don’t know if D.C. is ready for us! The CCD year is rapidly coming to a close. We only have two more classes. Last year’s class just received their first communion, and I’m so happy for them! I hope they remember everything we’ve taught them about it. 😉 Next year’s CCD will be here before we know it, though, and then it’s a new group of kids to teach about the sacraments and the trinity. Speaking of summer breaks: it’s summer here. Already! It’s supposed to be 90 tomorrow! Sadly, the pool doesn’t open until next week, when it’s going to be much more seasonal. Oh well. When the pool is open, it’s time for me to do my happy dance. Not just because pool=summer, but because I love swimming and it’s better than gym workouts! Although I have been very faithful to those gym workouts–going to the gym today, in fact. My schedule right now is two yoga practices a week, and three gym days. Yes, there are two rest days in there. I also need to get a strength program back on line, because I’ve been slacking here. I made huge progress this week on one of my novels, so I’m excited about that! It was the first one I wrote for NaNoWriMo, and I was in a hurry to get it done, so I left out a few key scenes, but now I’m going back and putting them in, an they’re fitting really well. I had to slash parts that were just way too crazy, but in general, I’m pleased with the shape of the manuscript.